The Rhin-O-Tuff ONYX 4000PLUS took the OD4000 and upgrade to a heavy-duty open-ended punching machine. The innovative Patented Swing Away Die Pin Retainer System allows the operator to quickly access and disengages all die punch pins. The Rhin-O-Tuff ONYX 4000PLUS took the OD4000 and upgrade to a heavy-duty open-ended punching machine. The innovative Patented Swing Away Die Pin Retainer System allows the operator to quickly access and disengages all die punch pins. Features the EZ operator changeable dies, capable to interchange within 12 standard die patterns (each die is priced separately). With the capability to punch up to 20 sheets of 20 lb paper, it will increase your production and efficiency instantly. Work with 12 different interchangeable die patterns, from comb and wire loop to Velo bind and 3-hole loose leaf. The premium punch machine ensures a discreet, yet powerful operation. Upgrade your system and provide your work atmosphere with the best in the market. Rhin-O-Tuff ONYX 4000PLUS is built like an rhino, it’s here to last. The OD ONYX 4000PLUS Punch Comes With An Auto Reversing Feature That Prevents Jams. All Dies for the ONYX 4000PLUS Feature Rhin-O-Tuff’s Ingenious Patented Swing Away Die Pin Retainer System. Allows Quick Access to all Die Punch Pins while Holding them Firmly in Place. Easily Disengage Any Die Punch Pin. Easy, “Paper to Pin” Sight Alignment, For Balanced Hole to Edge Margins on Odd-Sized Applications. Punching Capacity Rated up to 20 Sheets of 20 lb. or 80gsm. The Number of Sheets Depends on the Paper Weight and Punch Pattern Used. 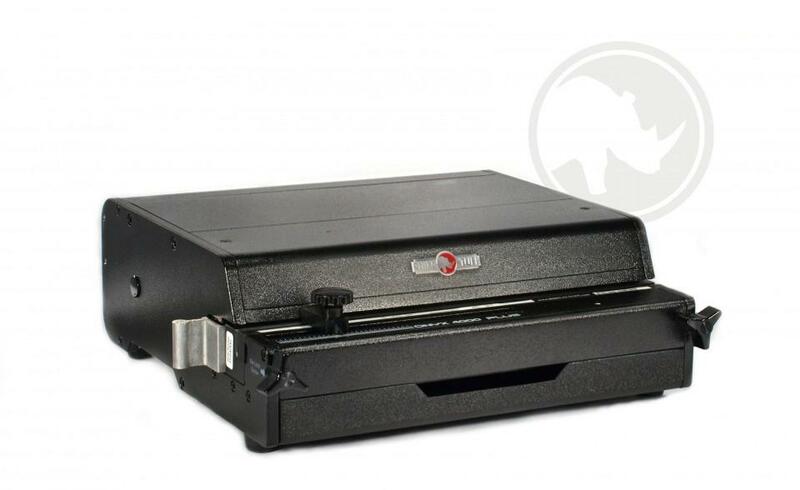 Uses 11″ (A4) Size Dies With Open Sides for Wider Sheet Punching Capability.